..and so when I heard that this was a thing, and then after a bit of searching myself was able to confirm it, well, I just knew I had to illustrate a campaign ad for such a hypothetical run for the presidency. Sure, you can tell by looking at the ‘About’ section of this blog that it is anti-neocon, but you know what? 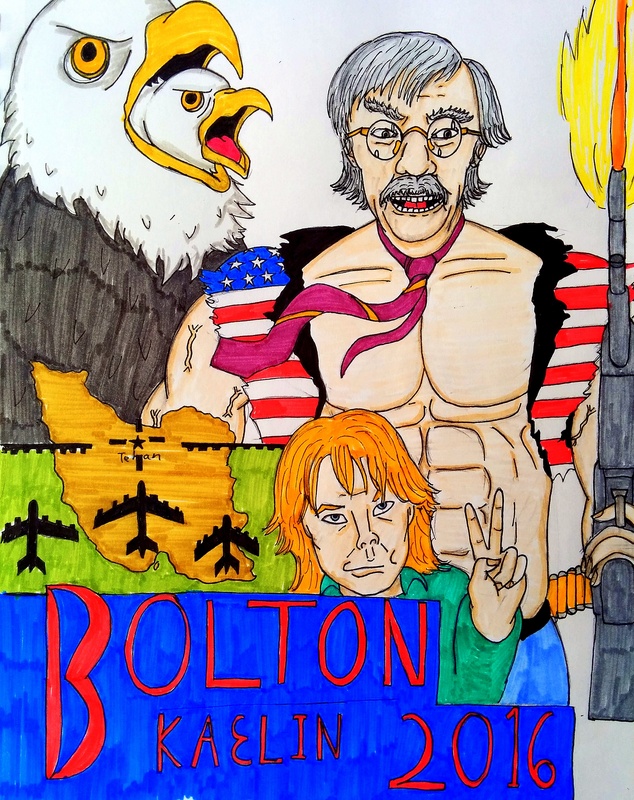 In a time where both parties seem to be running neoconservative candidates while disavowing that they are in fact doing so…well, even I can appreciate the blunt honesty of John Bolton-diametrical opposed though we may be. After all, if he can shift the debate towards national security issues (for once) it means the opposition might get more say as well on those very issues rather than just being shunted aside as usual. P.S. I put Kato Kaelin on the ticket in a craven attempt to appeal to all those people my age who are currently flooding social media with clickbait 90s nostalgia, but I am sure you could run basically anyone famous for that specific era to do the same.